1st... the plumber didn't come. I'm not surprised. Now, they say they will be here tomorrow between 10 and 12. Again, I'll believe it when I see it. So,we still don't have a toilet, sink, or fixtures yet. But Isreal (or as Zoe says, Isal) got things done that I wasn't expecting. 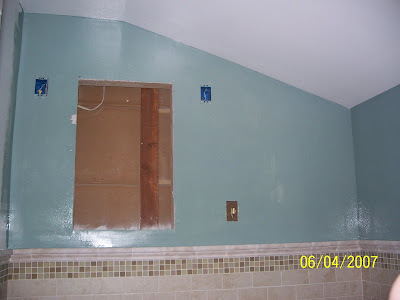 Like all the grout, and putting up all the new trim, and paint primer... and some paint. Woohoo! Paint. 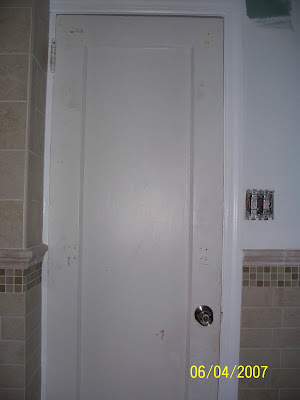 The new freshly painted trim shows you how the door is still waiting for paint. Eww. The window looks all shiny and new. Is that white trim or what??? 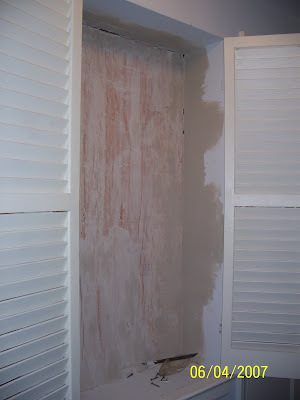 And there is one coat of the wall paint. Pretty? What do you think? We went back and forth between a nice (blah) neutral, and this color that is also in our new accessories (which I'll show you as soon as they're up). 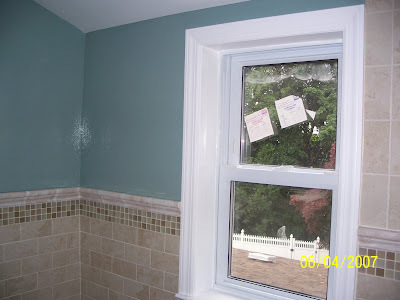 This whole wall got it's first coat of paint (which, by the way, is called Cloud Burst). 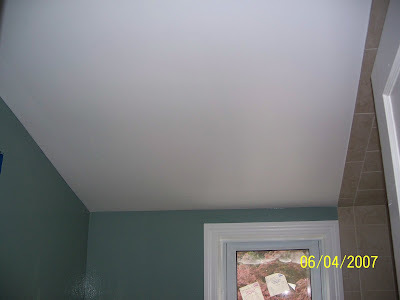 And, the ceiling not only got primer... but 2 coats of white... so it is done. So very perfectly white. While Isreal waited for primer and paint to dry he started putting our hall cabinet back together. It will be so nice to get that closet back and be able to put all the stuff back in there. Right now it's all in laundry baskets on our guest room bed. It amazes me how much stuff fits in this little closet. Slowly, but surely, we are getting our bathroom back. I can see it is going to be worth the wait (the very long wait). A bubble bath is in my near future.